Burnley Football Club have named Steve Stone as new Under 23s boss. The former England international replaces Michael Duff, who left the Clarets’ Academy last month to become manager of Cheltenham Town, as the club’s Lead U23 Professional Development Coach. Stone enjoyed a fine playing career with Nottingham Forest, Aston Villa, Portsmouth and Leeds United and was capped nine times by England. And he also arrives at Burnley with a wealth of coaching experience gained from five years at Newcastle United. The Gateshead-born former midfielder worked from Under 16 to first-team level during his time on Tyneside, developing young players and bridging the gap to the first-team environment as part of his brief. “I think this role suits me perfectly for what I’ve done in the past with my coaching,” said Stone. “It’s one that excites me as well, from the way Burnley are going with the first team, the way the training ground is set up and the way the young players are starting to develop and come through. “They have definitely progressed over the past couple of years to where they are now. “I think the job will take time. But Jon Pepper and Faz (Andy Farrell), and Duffo before that, have done a great job the way the team is playing at the minute. Stone watched the Clarets’ Under 23s extend their unbeaten run to five games with a 1-1 draw at Liverpool in the Premier League Cup on Sunday before officially starting his role in charge of the team today. 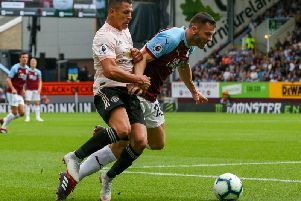 But it’s not totally new territory for the 47-year-old, a former Forest team-mate of Burnley manager Sean Dyche and his staff of Ian Woan and Tony Loughlan, who has previously been working in the Clarets’ recruitment department, along with carrying out some coaching duties in pre-season while Loughlan recuperated from hip surgery. “That’s massive,” Stone added. “Walking into a new football club and having to learn everything from scratch can be difficult sometimes. “I’ve obviously got a heads-up on what’s going on and now I’m looking forward to using the licence I have to go on and do the job I’ve been brought in to do. “Football’s in your blood. It never leaves you. I had two years out of the game when I retired 10 or 12 years ago, and you feel yourself itching to get back in. “It’s what you do, and this is another great opportunity for me to get back in. “I’m excited, not for me to do the job, but I’m excited to see what I can bring through.